The day had finally come to hike to the top of Saddleback Mountain. 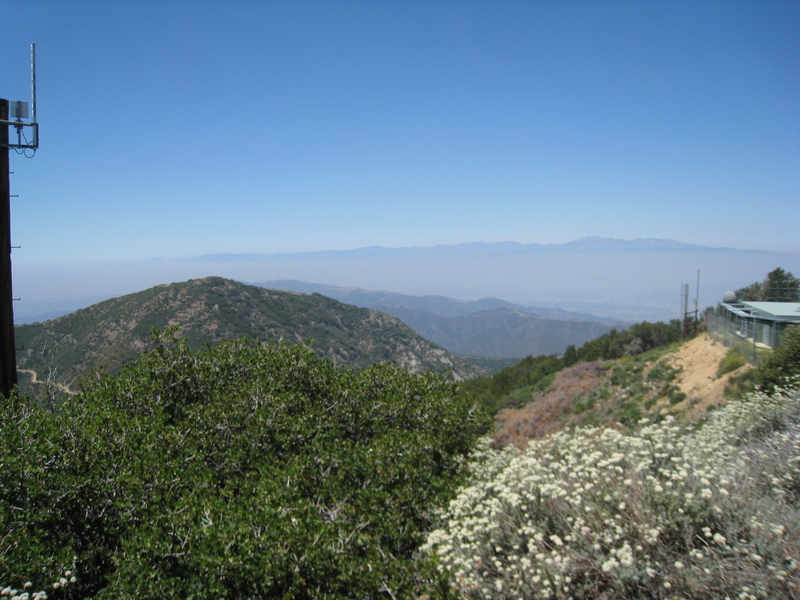 Santiago Peak sits at an elevation of 5,687 feet and is the tallest point in the Santa Ana Mountains. We hiked up to the top of the mountain starting out at the Holy Jim Trail head. The Holy Jim Trail runs into the Main Divide road which goes to the top of Saddleback. 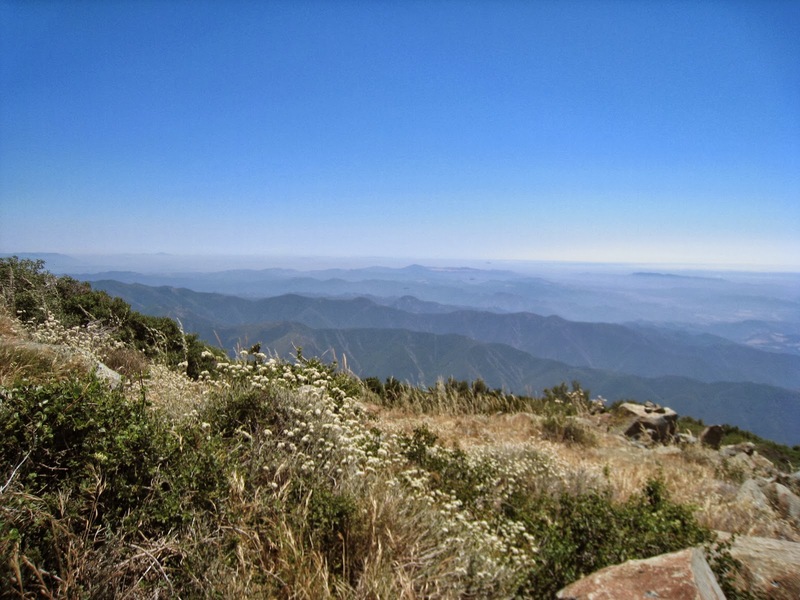 This is a must do hike for any Orange County Hiker! For more pictures make sure to check out our Facebook Page! Directions to Trailhead: Via the Holy Jim route to the top of Saddleback: From Cooks corner take Live Oak Canyon Road heading toward O'Neil Regional Park. Keep going until you pass Trabuco Creek, after which make a left and head up Trabuco Canyon Road (a bumpy dirt road), if you keep going on Live Oak Canyon Road you will run into the back of Rancho Santa Margarita and have gone too far. 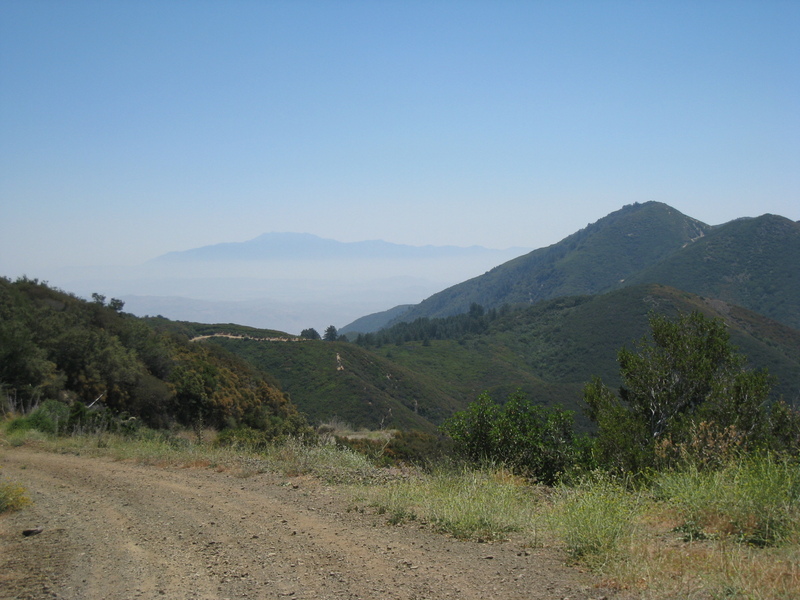 You will reach the parking lot and trailhead in approximately 4.5 miles on the dirt road (You will cross Trabuco Creek several times), the trailhead parking area is just past the volunteer fire house. I would recommend a truck with good clearance as some parts of the road are a little rough and I would not use this road anytime after heavy rains. 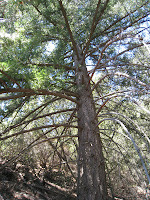 A Forest Adventure Pass is needed to park at the trailhead as it is located in the Cleveland National Forest. Description of Hike: The trail is 16 miles roundtrip with an elevation gain of around 4,000 feet. 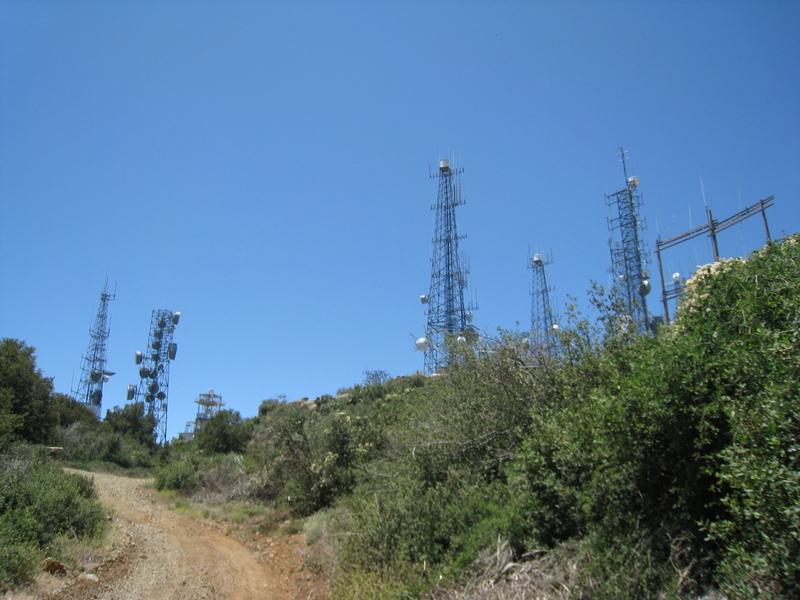 Santiago Peak is the highest point in Orange County and sits at 5,687ft. It is the best view in all of Orange County. The trail starts out in Holy Jim Canyon. The first mile and a half is in the canyon where there is lots of shade and usually water in the creek. 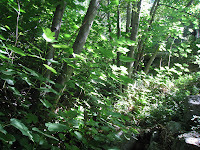 However, once you split off from the trail and head towards the main divide road, at approximately the one mile mark from the official trailhead sign, there is not as much shade available (There is a sign at the split, you make a left to head up to the top of saddleback mountain or a right to go to Holy Jim Falls). Make sure to bring plenty of water and sunscreen as this hike can get deceptively hot, especially during the summer months. The trail is well maintained and most likely when you go you will see someone on the trail. From the split it will be about 4 miles to the main divide road where you make a left and follow the road all the way to the top and enjoy the views. This hike will be about an 8 hour hike for most. It all depends on how long you enjoy the views at the top. Further Thoughts: Ashley and I were both prepared for this hike. We had plenty of water and were physically fit from the other hikes that we had done over the past couple of weeks. I would recommend that you do some training before doing this hike as it is strenuous. Possible training hikes might include Sitton Peak or Los Pinos Peak. When we hiked the trail on July 6, 2008, we could not have asked for better weather. It was a perfect 70 degrees when we started hiking. This was a welcomed change from the hot temperatures from only a couple of weeks ago. The canyon part of the Holy Jim Trail is awesome and is a welcomed escape from the urban landscape of Orange County. The canyon is covered in dense woodlands (mostly oak trees) and when we were there the stream still had plenty of running water in it. Both Ashley and I were surprised to see that amount of water still present in the canyon in July. On the way up the mountain, several of the springs also had water in them as well. During wet years, these springs might be a place to filter water from, however I would consider them unreliable sources of water. Bear Springs is located at an elevation of about 3,900 feet and will be located on the rights side of the trail before you reach the main divide road. Bottom-line is it was nice to see all of the green flora that was still there on the mountain. There was also quite a bit of pine forest on the mountain as well. The one thing we liked about this hike is that for the majority of the hike you can see your goal, the top of the mountain. Once you hit the main divide road and you head up the back side of saddleback, you are rewarded with great views of the Inland Empire. You can clearly see Mt. San Jacinto, Mt. San Antonio (Mt. Baldy), and Mt San Gorgonio (Which is the tallest mountain in Southern California at 11,501 ft). We enjoyed the view at the top of saddleback and ate lunch overlooking Orange County. There are multiple good locations to sit at the top and enjoy the view. It was a beautiful day and we could see for miles in all directions. It is always neat seeing the radio equipment up close and personal that we see, only at a distance, everyday in Orange County. 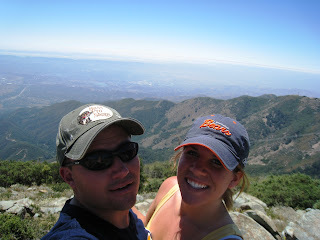 The only bad thing about the hike was that we could see all of the smoke from the fires burning up near Santa Barbara. 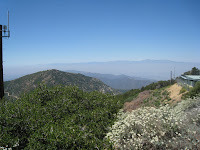 Also we wanted to note that during years when there has been a good rainy season in Southern California there can be a lot of bugs in the Santa Ana Mountains so it is a good idea to bring some type of insect repellent. We did this hike in good time. It only took us 7 hours to hike to the top and back down to the trail split in Trabuco Canyon, so we also decided to go look at Holy Jim Waterfall. Even in July there was still plenty of water at the fall. You will find, most years that rain has been average or above average, there is still water in the falls late into summer and the fall months. This is a great hike and it is very popular with other hikers. When we did this hike to the top of saddleback mountain we saw about 15 people on the trail. This is a must do hike for any hiking enthusiast and both Ashley and I highly recommend it. As always bring your camera as the views are breathtaking and you also have a good chance at seeing wildlife. Rating: Elevation Gain: 4,000 ft. (Strenuous), Distance: 16 Miles Roundtrip (Strenuous). Thanks for the blog, you guys. Very helpful! Doing this hike today... Nice work with the blog, very helpful! It is a great day for a hike, I am sure it was spectacular up top. Round trip how long was this hike? It is 16 Miles roundtrip, just for future reference all the hike write-ups have the total distance on them in the Rating Section. How many hours did it take to complete this roundtrip? thanks for posting this info. We are doing this hike tomorrow. How many oz of water did you take? Was it enough? When we did this hike I believe we each carried about 7 - 8 12 Oz water bottles each and that was plenty of water for the two of us. Enjoy the views and have fun on the hike! Thanks for posting all this info on your site. its the best hiking info ive been able to get. i just hiked holy jim falls and it was great and now im looking foward to hiking saddleback pk based on your review, it lets me know everything i was looking for. thanks! How was the trail? Do you need hiking boots or will a good pair of nikes do the trick? Just curious. I would say you would be fine with a good pair of nikes. Comfort is the key and which every are more comfortable will do just fine on this hike. Great post. Thank you! About to hike this tomorrow. Is a 2 liter hydration pack enough water? Do you think a hiking stick is needed? Any other good tips? Thanks! The trail is open year round. It would only be closed in the event of severe fire danger. Do you know if there is another way to hike to the top? We attempted this hike last weekend but the dirt road leading to the Holy Jim trailhead has been completely destroyed by rain. I doubt it will be drivable for months. This adds about 10 more miles to the 16 mile hike. We didn’t make it and just went to the waterfall instead. There are 3 other options to the top, but they are all longer. 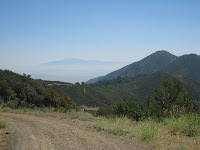 First would be going to the maple springs trail head and hiking to the main divide road which goes to saddleback peak. This is ball park 24-25 miles roundtrip. This is the same trailhead as our Beadford Peak Hike. Second would be from the harding truck trail. Look at our Laurel Springs hike for directions to the trailhead. That is also about 24-25 miles roundtrip. Another option would be to go off of ortega, by their blue jay camp ground. This one is a little shorter and is probably between 20 - 22 miles roundtrip. Sorry to hear about the rough conditions going to the trailhead. I don't hike but reading this sure makes me want to start hiking! Very informative. I will tell my hiking friends about your blog. When you reach Main Divide from the Holy Jim Trail, do you turn left or right to reach the summit? Thank you. When you reach the main divide road turn left. Have fun on the hike! Actually, when hitting the main divide the first time, you can turn either left or right and make it to the summit. Turning left means you stay on the main divide road until the summit. Turning right means you hike along the main divide for another 50 yards or so (little foggy on the distance) and you'll see a sign for Upper Holy Jim and up you go! UHJ will eventually connect with the same main divide road again, but the views from UHJ trail or worth the extra effort imo. UHJ is also the most strenuous section of the entire hike - it's just a little steeper, but doesn't last too long. P.S. The site is awesome! Lots of great info here. 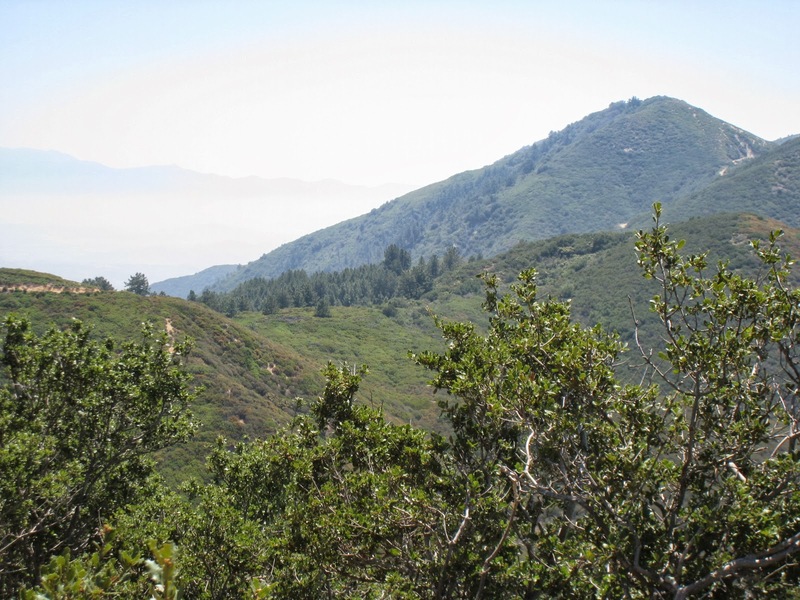 If you park at the turn from Live Oak Canyon Road onto Trabuco Canyon Road, it will be approximately a 4.5 mile hike to the trailhead for a total of 9 additional miles to the hike. We just added that information on the "directions to trailhead" section of the write-up. Thanks guys! I posted in regards to potentialy parking outside the dirt road. Well I just paid for a pass. :) great hike a bit tougher than I was anticipating. Bug spray is a must! If anyone does not like bees or the sound of them, I suggest ipod. Some how I made to the top in 3hours 20min with a couple short stops on the way. Paying for my speed this morning. Great write up and thanks for replying. Does anyone know if it is possible to transit the peak, i.e. comeback down the Riverside side of the mountain? I know that there is an abandoned trail called Coldwater Canyon trail. Ideas? Many thanks for posting your blog! I am new to the area and would like to explore more of the outdoors. 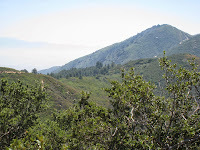 I have looked Saddleback and Santiago Ridge online and in walking books and can find very little. Are there any shorter treks that take you to the peak? This is the shortest trail to the top of Saddleback. There are several other ways that are longer, but this one since it is the shortest is your best bet! 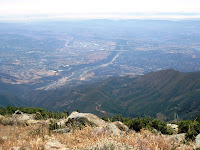 I live in RSM, i have hiked once before to the top after spending the night camping in oniel.. its been a few years since i made it to the top, this was a very helpful reminder of what this hike actually is... Thank you very much for your input! ive been living in Mission Viejo for 10 years now and ive always wanted to hike Saddleback. My inlaws are in town this week and we were planning on hiking saddleback this saturday. I was just wondering if there is any way of hiking saddleback during or after a rain/snow storm? Does rain/snow make the hike nearly immposible. It all depends on how much rain we get. If there is enough rain the road to the trailhead will be impassible and the first section of the trail would likely be impassible as well. A year or so ago, during the record rain we got in December of 2010, several people had to be air lifted out of the canyon as they got stranded due to the rising water. It all depends on how bad the storms are. Additionally, it can get really windy up top after the storms and if the weather forecasts are correct for this next storm you are looking at possible snow above 5,000 feet. We would not recommend doing the hike during a storm. We would probably not recommend doing it right after a storm either, but it would depend on how bad the storm was. Thank you for the valuable information you guys are the best!!! Saddleback Mountain is a great hike and the area is just beautiful to begin with. The OC is one of my favorite places to be in the summer time along with Santa Barbara, they have some great hiking as well !! 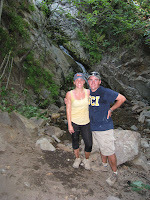 Water falls and good hikes that will work you out! I always loved going to Laguna Beach as a kid though, hiking and playing in the coves all day was the best way to spend any summer day. Though if you are ever in Santa Barbara- it's seriously a great place to be, I was just there and loved every minute of it as well! I stayed at the South Coast Inn (www.goleta-hotel.com). Close to my old school and wonderful trails and beaches! The OC has a ton of great hikes but I have to agree with the above comment- Santa Barbara is also a great place to vacation as well as hike! I've been there so many times and the hikes give such great views, they really never get old. I was there a few months ago and had a great time playing at the beach and hiking all in the same day, only in California! We love staying at the Sandman Inn (www.thesandmaninn.com). Cheap and a great find for hotels!